WordPress is by far the most popular way to build a website, whether it be a blog, eCommerce shop or simple business site. Most of the time eCommerce professionals talk about how WooCommerce is the go-to online shop plugin for WordPress. Sure, it’s a wonderful tool for selling physical products, but what about digital items? 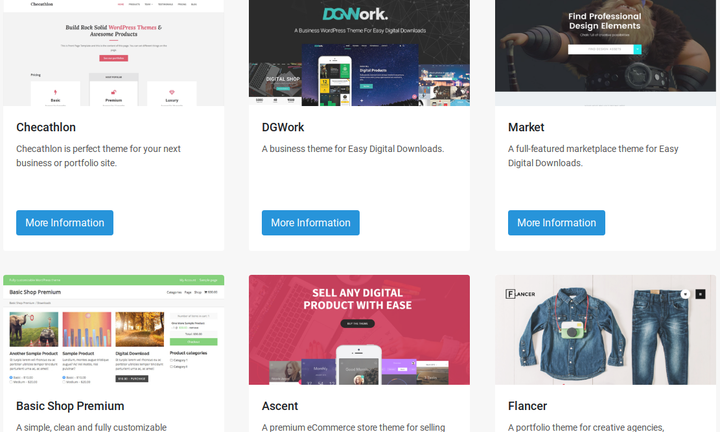 You do have a few WooCommerce tools for selling digital goods (and some additional plugins try to expand that,) but they don’t quite compare to Easy Digital Downloads (EDD). Not only does EDD focus completely on selling those non-physical products, but it has a wide variety of extensions for bringing more functionality like physical product selling and memberships. Therefore, I want to complete an in-depth Easy Digital Downloads review to uncover the pros and the cons. Should everyone looking to sell music, eBooks, podcasts, and documents turn to EDD? Let’s find out. The glory of EDD comes in its shopping cart. It only takes a moment to implement it on your website, then you can start posting products for sale. It gives you the option to choose between Buy Now or Add to Cart buttons, and the text on these buttons is fully customizable. What’s more is you can require customers to agree to your terms if selling something that you don’t want being shared illegally. Both guest and registered user checkouts are available, and customers can go into your shop and save the cart for later. The main reason I like the shopping cart so much is because of the user-interface from start to finish. Basically, a user comes to your store, puts something in their cart, checks out, then receives a branded email with a link to download their product. EDD comes in the form of a WordPress plugin. Anyone who’s ever installed one of these knows that it only takes a minute. After that, EDD shows up on your dashboard under a Downloads tab. 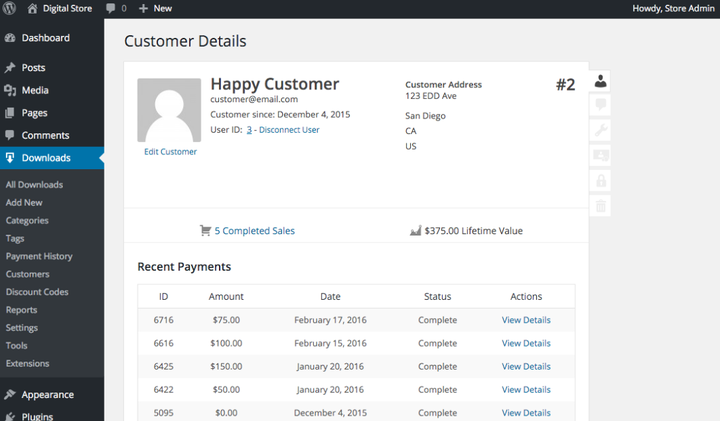 This is where you can add a new product, adjust categories and tags, and view your payment history. A full customer management area gives you the tools to block or target some of your customers. You can also take a look at reports to forecast how much you’re going to make. Once you have a few products in the store it only requires a shortcode to place the products anywhere on your site. Then, the system is pretty much ready to go. Your customers come to your site, make a purchase, and everything else is done in the background. Guess what! 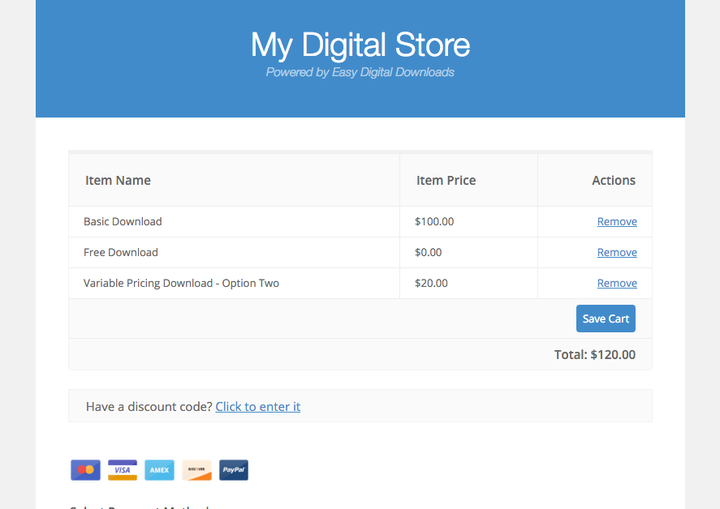 You don’t have to pay a dime to download Easy Digital Downloads. So, if you wanted to, you could configure a complete digital eCommerce site for, say, your music. No upfront costs would be required as long as you didn’t need any additional functionality like recurring payments. Payment processing can go through PayPal, but you’re going to have to pay for more advanced gateways like Stripe and PayPal Pro. 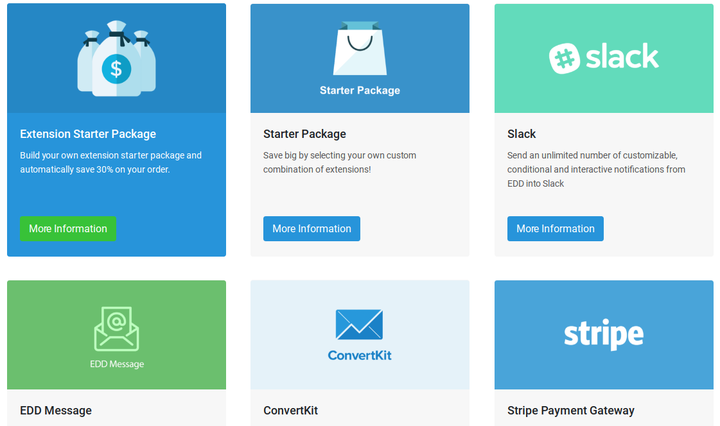 The add-ons vary in price, but they have starter packages for around $150. If you opt to purchase some of the add-ons individually you’ll end up forking over anywhere from $0 to $500. Furthermore, some of the themes offered on the EDD website can be downloaded for free. However, premium themes are sold elsewhere for around $60. Some might say that paying for add-ons is a downside. I would argue otherwise, since even a $200 add-on cost should be recouped in a short amount of time. Not only that, but all of the add-ons are sold as one-time payments. This is different from many other premium WordPress plugins that force you to pay a monthly fee. Overall, the add-ons are plentiful and useful for all sorts of businesses. And you won’t have to pay for them on a monthly basis. The discount codes come in handy when you’re trying to sell more products during a certain time period. For example, you may have a plan to sell a certain amount of digital items during the holiday season. What better way to do this than with some discounts? The good news is that these discounts are built-in, meaning you don’t have to pay for an add-on. EDD allows for flat rate or percentage based discounts. You can specify which of the products you would like to include or exclude from that particular discount, while also limiting the number of times someone uses the discount code. 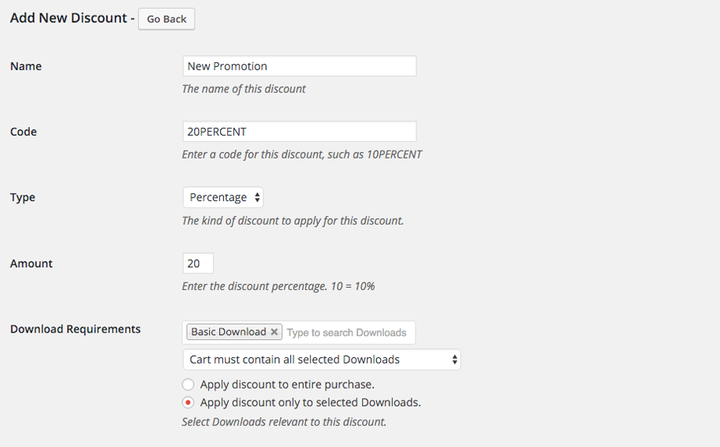 Along with required minimum cart totals, and end and start dates, the discount functionality is rather solid. We mentioned themes a little bit above, but now I’d like to show you what they look like. First of all, you can go to the EDD website to download some beautiful free themes. I would personally go with a premium theme (since they look better,) but a hobbyist might find the free themes intriguing. They also have a full community with recommended themes for you to choose from. The majority of them go for a price, but you might be able to locate some free ones in there. Finally, we recommend checking out ThemeForest since those EDD themes are affordable and you can look at reviews and comments before buying. The quantity of EDD themes isn’t nearly as much as what you would find for general WordPress or WooCommerce themes. However, the collection is respectable. Oh yea, and EDD technically works with any WordPress theme in the world, so you can integrate with your current website if need be. Whenever I configure an eCommerce site through places like Shopify or WooCommerce, I don’t have to pay for the privilege to use the payment gateway. 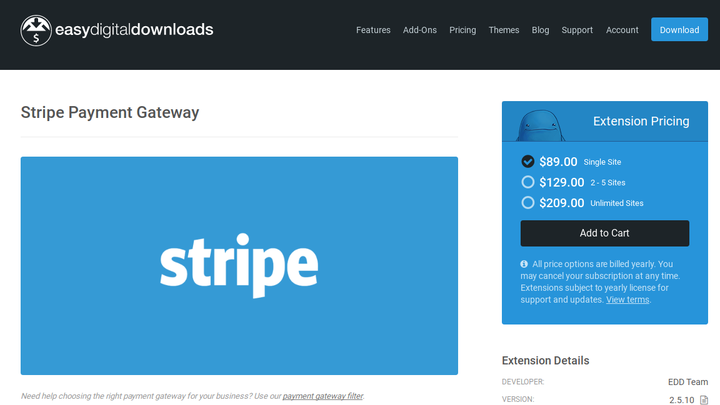 This might be because of the fact that EDD is given away for free, but it’s strange that you must spend $89 to put Stripe on your website. And that doesn’t include the Stripe processing fees for each of your transactions. The good news is that EDD doesn’t charge any transaction fees, so you’re in the clear there. Some of the other payment gateways you’ll have to pay for include PayPal Pro, Bitpay, Skrill, BrainTree, and more. Here’s the one big qualm I have with Easy Digital Downloads. Yes, the majority of the sites I build are on WordPress, but it would be really cool if Easy Digital Downloads could be placed on other content management systems or eCommerce platforms. Therefore, I can’t recommend EDD to anyone without a WordPress site because it’s not even possible to make the integration outside of WordPress. You would think they would have an app of some sort on Shopify and Bigcommerce, but that’s not the case. Overall, WordPress is the most popular place to build a website, so that’s at least reassuring, knowing that the majority of people will already be on WordPress. 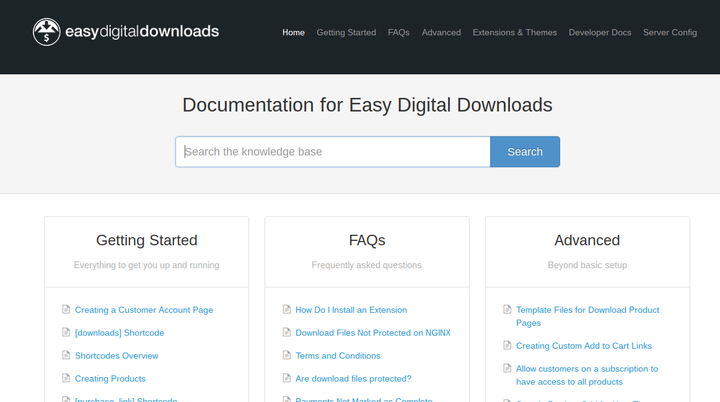 The Easy Digital Download support includes a blog, documentation, open ticket support and paid priority support that always puts you in the front of the queue when you have a question. I understand that a free theme isn’t going to provide a chat box and phone support, but you’d assume that you’d be able to call someone if you paid $299 per year for priority support. This is a small problem I have with Easy Digital Downloads, since you have complete freedom to go with the free support and not pay a dime. However, it would be nice to at least give the option for better support for beginners and people with complicated websites. Other than that, the documentation is pretty incredible, with links to articles about everything from creating a customer account page to handling register forms. I just want to make sure that everyone understands they’ll have to complete most of their own research when they have a question or problem with their site. And you could always make a Google search to stumble upon the many blog posts covering Easy Digital Downloads. The only reason I would recommend against Easy Digital Downloads is if you have no intention of making your site on WordPress. The add-on prices might turn some people away, but a profitable store should be able to recoup those costs pretty quickly. Other than that, the free pricing is wonderful, you don’t need to be a genius to configure the shopping cart, and it integrates with so many other platforms and WordPress themes. If you have any questions about this Easy Digital Downloads review, or if you’d like to state your own opinion, let us know in the comments section below.